Size: 5.8" x 3.1" x 1.4"
Introduced together with the TI-58 and TI-59 the TI-57 represented the low budget programmable calculator of that epoch and replaced the SR-56. Unbelievable that this powerful calculator made use of the one-chip approach of the SR-40 calculator. A sales brochure of 1977 says: "The key to its value is a remarkable advance in integrated circuit technology - a single MOS/LSI chip with the equivalent capacity of 30,000 transistors". Well, today the guys of TI integrate millions and millions of transistor on one chip. A novel step was the squeezing of key entries into program code, the time before the memory hold the key codes. This technique allowed up to 3 key entries (i.e. INV-2nd-sin) to be compressed into one program step. Sure that marketing sold a calculator with 50 memory places as a calculator with 150 program steps! Please read this interesting comment from Anders Persson: "However, it was actually possible to pack up to four keystrokes in one step, not only three. An instruction like INV-2nd-Prd-4 would still fit in one step (code -39 4). Admittedly, not many instructions took four keystrokes - perhaps this is the only one...". If you are interested in the calculating accuracy of scientific calculators don't miss the Calculator forensics. Early in production (about wk 36 year 1977) TI changed the battery pack and the related connector and charger from the SR-51-II style to the TI-55 style. The battery packs are not compatible, don't use a BP6 with a AC9132 charger ! Later in production the metallized TI logo was replaced with an unmetalized. This gives in total 3 different US versions. View here the TI-57 w/o chrome. Finally we should add an early TI-57 assembled in Italy with different styling. The TI-57 was sold under the label of Radio Shack as EC-4000 and in Hungary as Híradástechnika PTK-1050. The calculator was available till 1982. 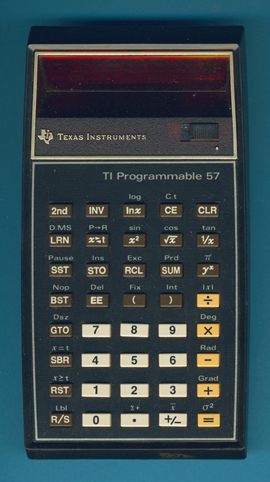 The TI Programmable 57 is featured in the Texas Instruments Incorporated bulletins CL-274 and CL-283 dated 1977. The self-teaching programming system for student and professionals. Eight multi-use memories provide addressable memory locations to store and recall data. Powerful program memory stores 50 fully merged steps (up to 150 key-strokes). Once a program is built, it can be executed repeatedly by supplying new sets of variables. Computer-like programming functions help solve repetitive problems quickly and accurately. It’s also a powerful super slide rule calculator. AC adapter/charger and carrying case included. Making Tracks into Programming. Takes you into the power and fun of programming right away, with step-by-step instructions and examples.